Streetglo Boat lettering name reflective decals and letters. Design your boat name or boat registration numbers/letters online for free. Reflective Boat Name Decals can be combined with reflective boat graphics to insure you are seen on the waterway! 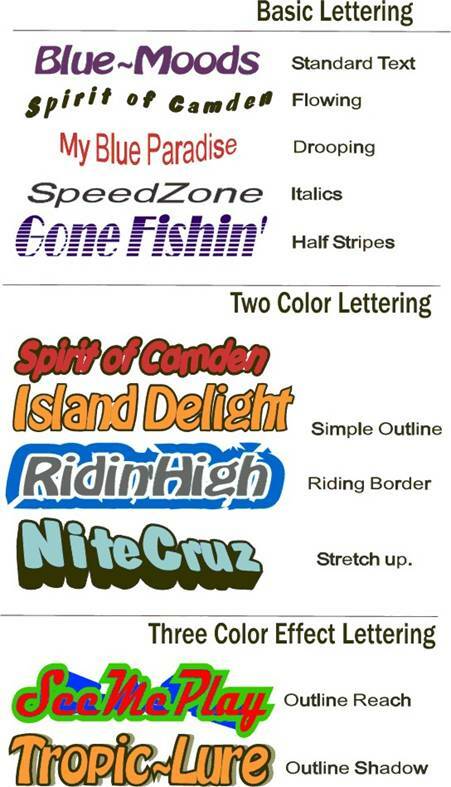 DESIGN YOUR BOAT LETTERING / BOAT NAME online! DESIGN YOUR BOAT NAME DECAL NOW. Easy to Apply Vinyl Boat Lettering, Vinyl Boat Names, Boat Signs, Vinyl Boat Decals — Design online! Vinyl Boat Lettering is available in all type styles and nearly all special effects such as outline, trace, shadow, etc. We can provide your boat lettering in all types of text styles. An average outline boat name sells for under $30.00. A reflective version sells for under $50.00. Our boat names can be easily installed and are shipped ready to apply. Your vinyl boat name can be designed with or without special effects. 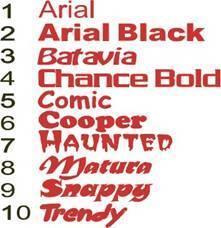 See the Vinyl Boat Name samples below for an idea. Our Vinyl Boat Names and Boat Lettering is supplied in premium long life exterior grade vinyl for a lasting appearance. Decal Catalogs available from the HOME PAGE! Your boat name decal includes our special bright LumaStripe vinyl. However, you can also order in any of these stock colors by simply modifying your order by email.